Hooray! The day has finally arrived. The Secret of the Abbey is out and available on Amazon. Go to the home page to read the summary of the third and final installment of The Watchmen Saga. Click on the button on the left for a direct link to Amazon. 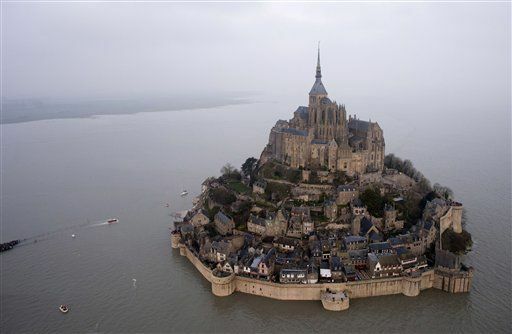 I just came across this interesting article about a discovery made on La Grande Rue (the main street) of Mont Saint Michel, just outside the village church of Saint Pierre. 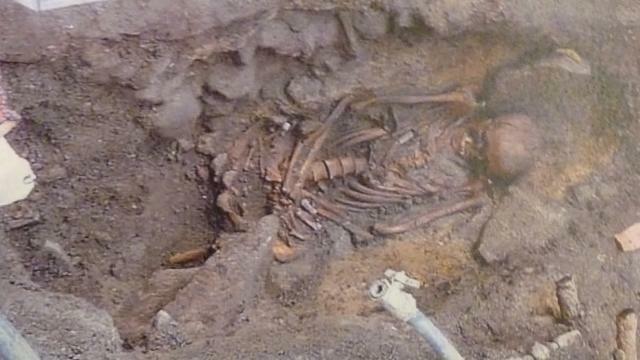 While doing some updating of sewer and water lines, crews uncovered 14 graves with human remains dating back as far as 800 years. The skeletons were carefully lined up, separated by stones, with their arms crossed over their stomachs. Archaeologists from the French National Institute of Archaeological Research (Inrap) are currently on site. It is believed that these remains were part of a medieval cemetery. The current village cemetery sits on the opposite side of the church. My family and I are avid followers of the Tour de France, the 21-stage bike race that winds through the magnificent scenery of France every July. The Tour covers some 2,200 miles (35,000 km). The number of teams varies between 20 and 22, with 9 riders per team. The last day always ends up on the famous Paris boulevard, Le Champs Elysees. We have been on hand in France for several stages, and hope to do more "tour following" in the future. For me, Stage 1 of the 2016 Tour was the best stage ever, and not because we were there, but because both the starting point and the ending point are special places to me. Stage 1 left from obviously one of my favorite places in the world, Mont Saint Michel, and ended at Utah Beach, one of the D-Day landing beaches, which I consider to be sacred ground. Check out my blog entry about the Normandy Beaches (click left, or go to "more" on the home page and click on Blog), and also check out some of the amazing footage below, including the salt marsh sheep sporting the colors of the yellow, green and polka dot jerseys of the Tour. When you are on the main site, you can click on several videos under "The Stage in Videos." My pilgrimage to see the purported ring belonging to Joan of Arc was unfruitful. My husband and I spent two days at Le Puy du Fou, (click to see the English website) the excellent historical theme park in the Vendée region of France, southeast of Nantes, but unfortunately, because of the continued controversy with the British government over the right of the theme park's owner, Philippe de Villiers, to own the ring--even though he legally bought it at auction in England--has resulted in its not being on display. 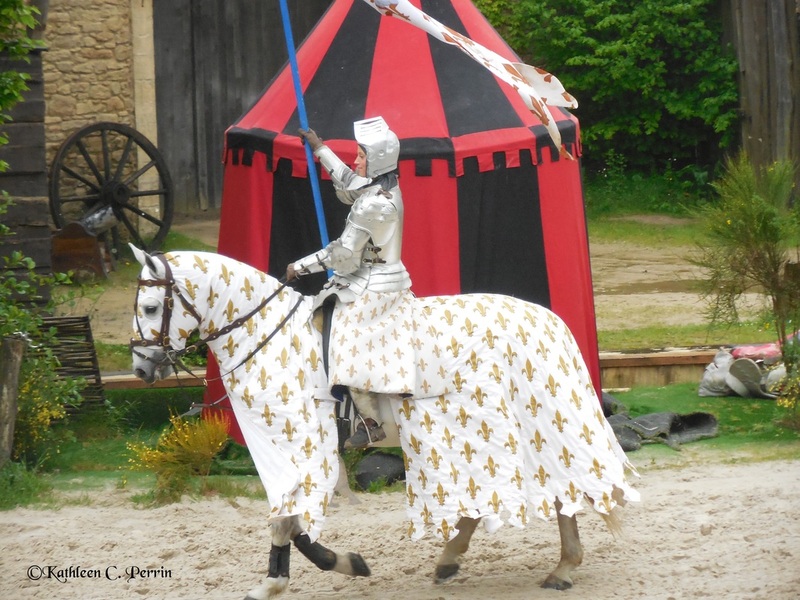 Check out my blog (click on "more" above to lead you to the blog) for more about our visit and a slide show on Le Puy du Fou. In other news, we managed to avoid the catastrophic rainstorms that ripped through France the week after our departure, maneuver through the blockades on the roads set up by the truckers, avoid the riots in Rennes and Nantes, and find enough gas during the refinery strikes to make it back to the airport. The favorite pastime of French workers is going on strike, and every time we go, we seem to find a way to fall right in the middle of the turmoil! Vive la France! ​I just got back from France where I made my tri-annual visit to Mont Saint Michel, only to find the abbey church spire covered in scaffolding and the statue of Saint Michael removed! Standing 500 feet (156 m) above sea level, the 1800 pound (800 kg) statue, which measures 15 feet high (4.5 m), was removed from the spire by helicopter in a remarkable display of technical skill. Click here to see a film of the statue being removed. The statue was then taken by truck to the Socra workshop in Dordogne, which specializes in the restoration of large statuary. The work of Emmanuel Fremiet, the statue was installed in 1897 and up until now, has been restored only one time during that period, in 1987. The abbey's administrator, Xavier Bailly stated: "We need to re-gild the Archangel. At the same time Michael's sword and wings, which serve as lightning rods, will be upgraded to meet current safety norms." The statue's protective yellow paint and any remaining gilding was removed down to the copper base. Then all corrosion was repaired, and the statue was repainted and re-gilded. We just missed the statue being reset on its perch on 26 May. Click here to see the statue's triumphant return, which is even scarier. I'm glad Michael's absence wasn't prolonged, and especially glad I wasn't one of the workmen on the spire! Remember how I posted that a French theme park, Le Puy du Fou, bought what was supposed to be Joan of Arc's ring at auction for nearly half a million dollars? 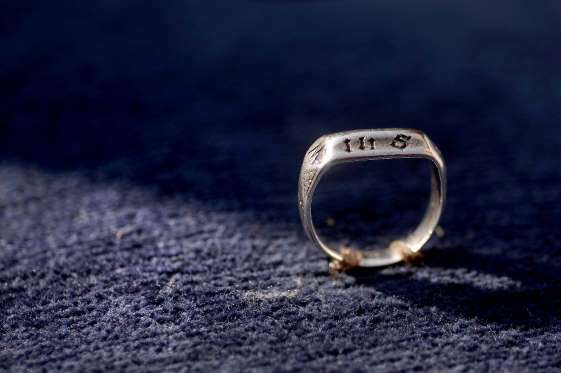 Now the English are furious and want it back, claiming that "this ring is part of those objects with high national symbolic value and as such should be part of a special legislation." Hey, they already burned Joan at the stake, and now they're claiming her ring has high national symbolic value for them? How about it having "high national symbolic value" for France! British Want the ring back! ﻿﻿﻿﻿Joan of Arc's Ring Back in France After 600 Years ? First the Sword, now the Ring? 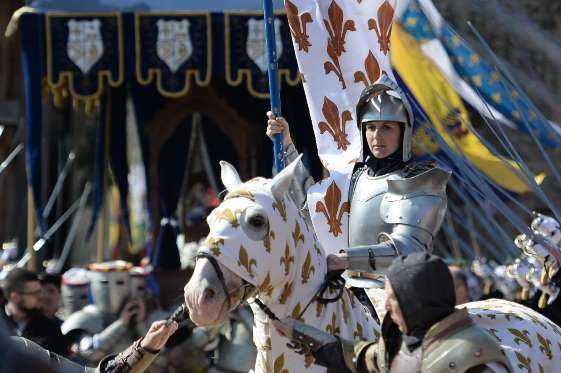 The owners of a historically-themed amusement park in France, Le Puy du Fou, just purchased a 15th century ring at auction which they claim belonged to Joan of Arc. After 600 years in the United Kingdom, the ring has returned to France. My husband and I are heading there in May to check it out, and I'll let you know what I think. To read an article about the ring, click on the button above, and for a second article about the ring from the History Channel, click here. 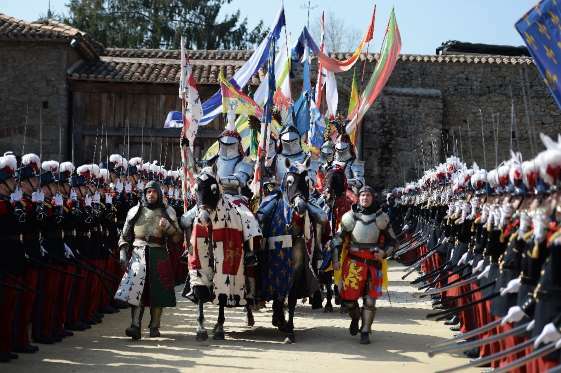 To read about the incredible theme park Le Puy du Fou, which was voted best theme park in the world last year, click here. The Puy du Fou is located in Les Epesses in the Vendée Region of France, south of Brittany, between the cities of Cholet and La Roche-sur-Yon. On March 20, 2016, more than 5,000 spectators watched the military procession as the ring was ceremoniously brought into the park carried on a cushion in a wooden ark, accompanied by its own honor guard and an actress on horseback playing the role of Joan of Arc. 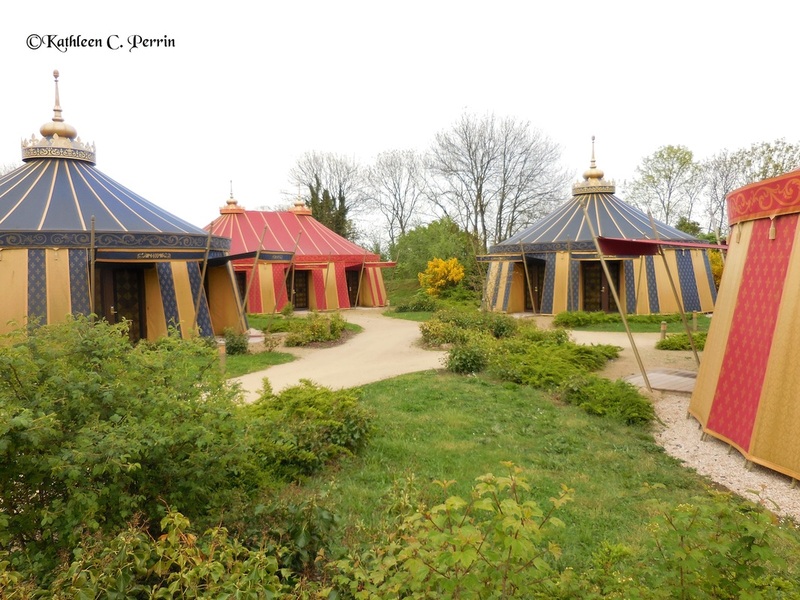 "The ring has come back to France and will stay here," said Philippe de Villiers, the founder of the Puy de Fou. Vive La Pucelle et Vive sa Bague! The Sword of the Maiden was featured on France Book Tours from March 7-26. Click below to read reviews. A very special thanks to France Book Tours and Emma Cazabonne for organizing a very successful Book Tour. Click below to read the reviews, or check out my "Reviews" page. March 27: Click here to read Emma Cazabonne's review on her blog Words and Peace. March 14: Click here to read my Guest Post In Joan's Footsteps posted on "History from a Woman's Perspective." (or check it out on my blog). March 12: Click here to read the review on BOOK NERD. March 9: Click here to read Jacqui's review on Amazon and The French Village Diaries. My favorite line from Jacqui's review: "Not since Harry Potter have I been so captivated by a Young Adult novel and I had to idea French medieval history could be so interesting." Made my day! March 7: Click here to read the review by Lauralee Jacks on her blog "History from a Woman's Perspective." 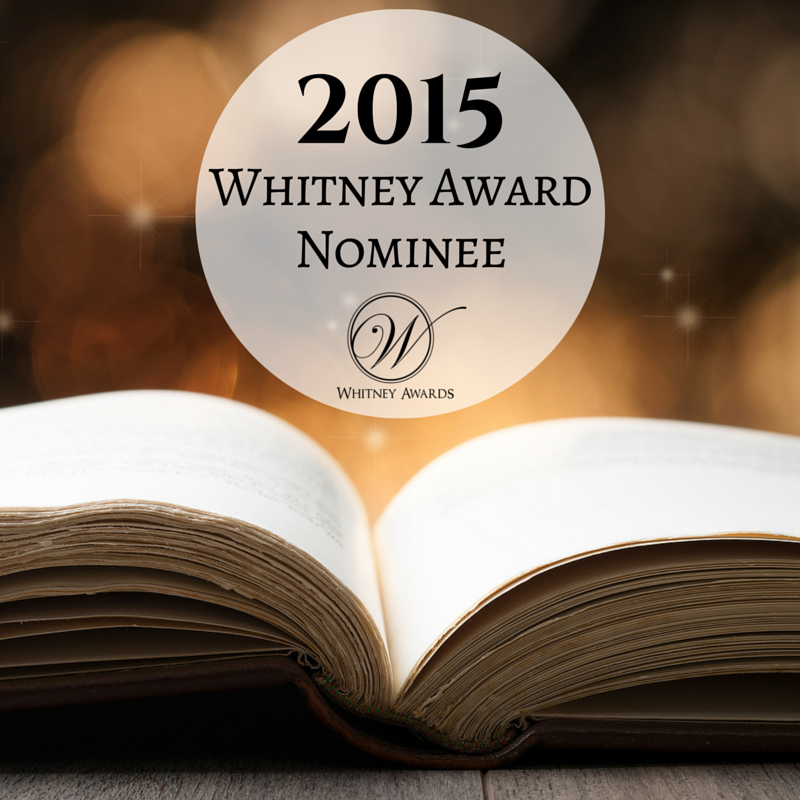 ​has been nominated for a Whitney Award in Historical Fiction. Thanks to all of you who nominated the book! Check out the remarkable new documentary produced by BYUtv, entitled Joan of Arc. It was filmed on-site in France and you can watch it on-line. It is well worth your time! "Could a nineteen-year-old girl change the course of history simply by faith? From ordinary farm girl to extraordinary hero, the life of Joan of Arc was one of conviction and courage. Fifteenth-century France was devastated by an ongoing war in which women did not fight. Yet Joan heeded the counsel of angels and transformed into a military leaderÑsomething her country needed but many feared. In this BYUtv original special, discover the stalwart spirit, military prowess, and enduring influence of Joan of Arc." was the third most looked-at book onFrance Book Tours for all of 2015! ​Check it out by clicking here: France Book Tours. Are you a member of a Book Club that has read The Keys of the Watchmen or The Sword of the Maiden are you planning to read one of the books as a group? If you are considering a discussion about one of the books of The Watchmen Saga, I would love to be a part of it! Contact me with “Book Club,” in the subject line and we'll try to make it work either in person (based on distance and availability) or via Skype. 1. Which character in The Keys of the Watchmen do you relate to the most? Why? 2. How does Katelyn's relationship with each of her family members impact her behavior? 3. Why do you think Katelyn is so 'snarky' after being taken back in time? What would your reaction be if it happened to you? 4. What main themes does the author explore? 5. How do the characters evolve as the story unfolds? 6. How did the truth about the death of Jean's son make you feel about him? Do you admire him less or more? 7. How did the historical setting of the novel add or detract from the plot? Was the author successful in integrating true historical facts? 8. Katelyn and Nicolas are opposites in many ways. Can opposites have successful relationships? What other impediments stand in the way of their relationship? How can they be overcome? 9. How do you think Katelyn will deal emotionally with what has happened to her? 10. Do you have any ideas about what the 'secret' of the mount is? What clues about it did you find? Many of you have asked me when Book 3 in The Watchmen Saga will be released. I will do everything in my power to get it finished as quickly as I can. I can't make any promises, but barring some catastrophe, I can say it will be out before the end of 2016. It will be the final installment in The Watchmen Saga. The book already has a title, but that title reveals quite a bit, so you'll just have to wait. I am leaving for France soon to take more photos and do research for Katelyn's final adventure. So, the first hint is out. Yes, it will take place in France. So now you know the broad "where," but do you know the "when?" And will Nicolas be joining her? Stay tuned for more details!